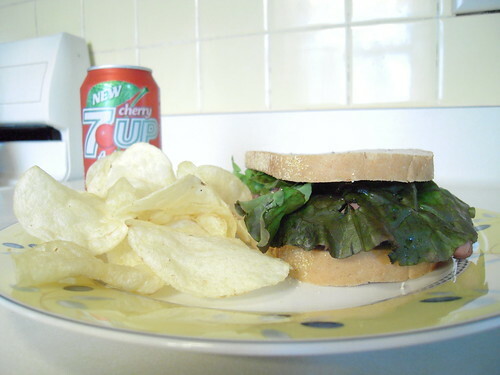 Alright, so this sandwich is horribly unhealthy. 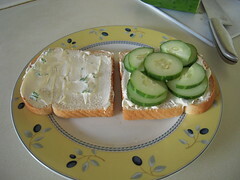 I was going to rock the cucumber and chivey cream cheese sandwich, but when I pulled out the cucumber in my fridge..it was growing! So I improvised. With bacon. 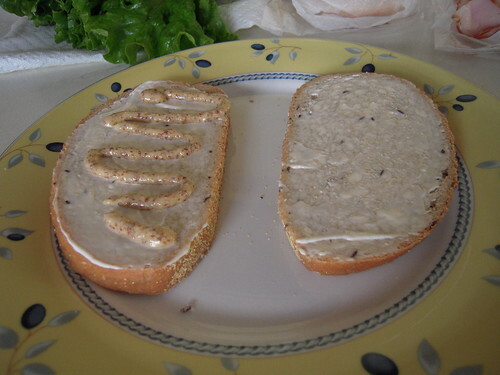 This sandwich would be really good for breakfast. 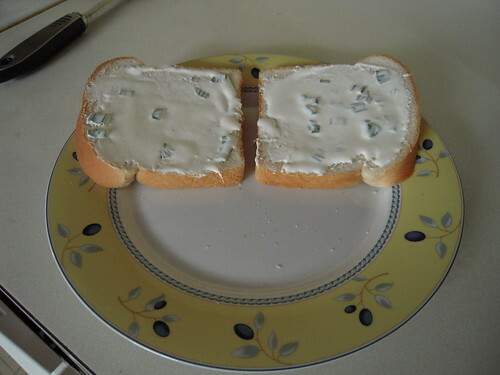 I think it would work better on a bagel, even. 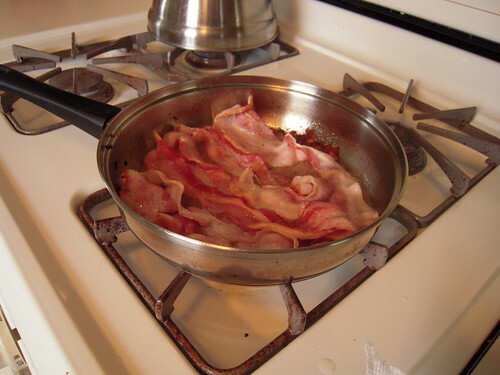 Step 1: Fry up a few pieces of your favorite thick bacon. 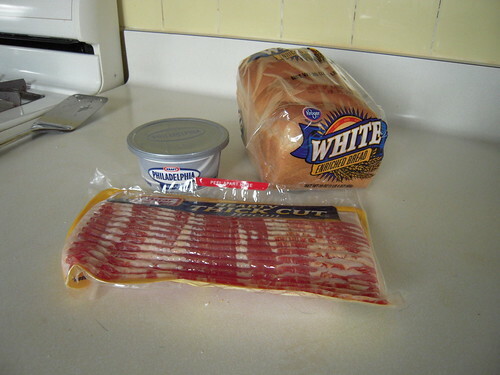 Step 2: While your bacon’s frying, spread the cream cheese. No brainer. 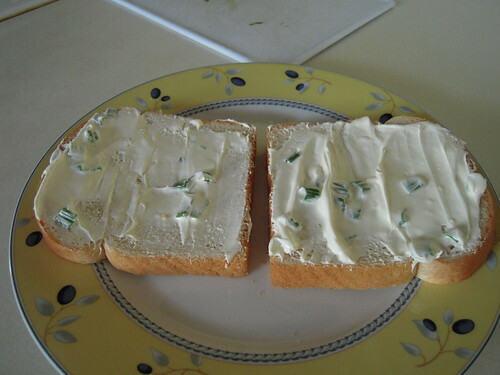 Mine has chives in it, but I think this sandwich would be better with plain. Your call. 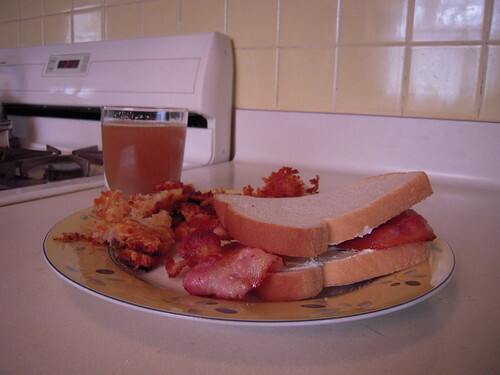 Step 3: Enjoy with some hashbrowns! 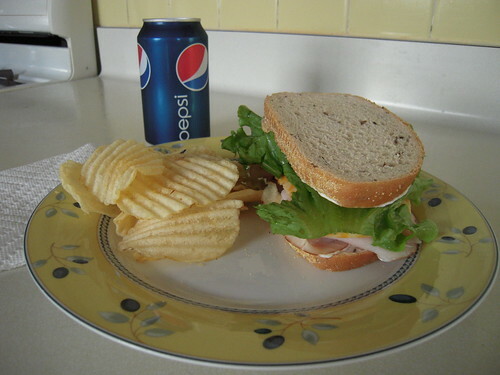 Try not to think to hard about the nutritional value of your lunch. 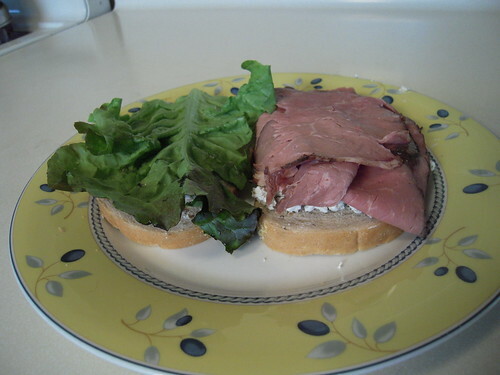 This might or might not be the last of the sandwich posts. It might just be too silly..and I’m running out of ideas. During one of my teenage birthdays, my mom helped me throw a tea party for my friends. My friends and I got all dolled up in summery dresses and funny hats, and it was a blast! In planning, we tried to make it as fancy as possible, with all of the little candies and pastries and everything. We had several different fancy little finger sandwiches that we put out. 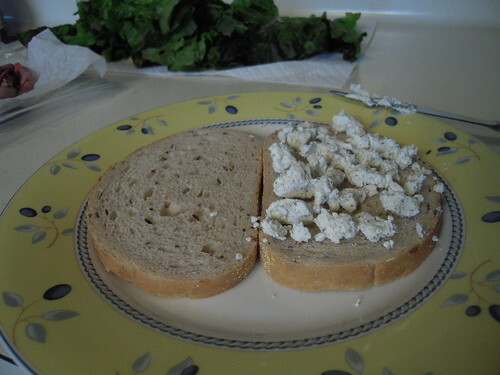 Here’s a scale-up of one of those mini sandwiches that works really well as an everyday lunch. 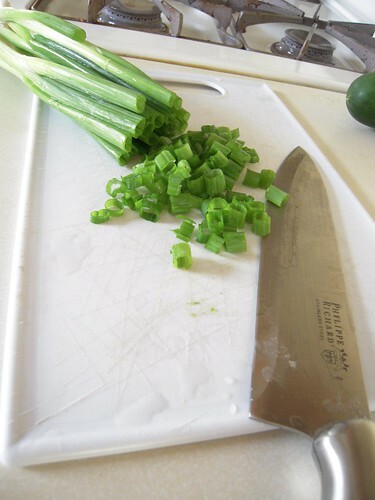 Step 1: Chop the chives! 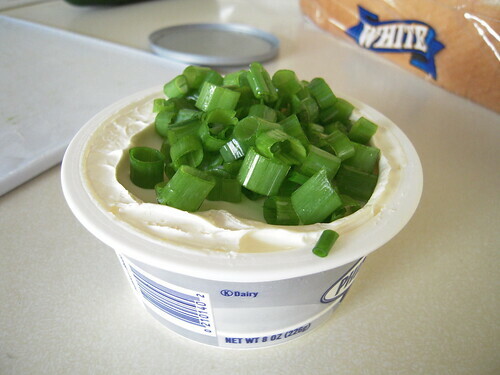 Step 2: In order to make the spread for this sandwich, you will need to stir the chives into the cream cheese. The degree of onioniness is totally in your hands; I like a lot of flavor, so I tend to add quite a few. It’s up to you. 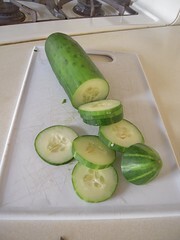 Step 4: Chop the cucumber and place the slices on your sandwich! Step 5: EAT IT. Mmm! I remember back when I was maybe 12, I had a crush on this guy in my class who was from France. I don’t remember a thing about him except that he was French, and that I stole his sandwich idea. So you may feel free to pretend that this is classy and foreign and whatnot. In any case, it’s simple and delicious. Step 1: Rock out with the cheese. I went for the cut-then-crumble method, but I’m pretty positive that spreading would work just as well. 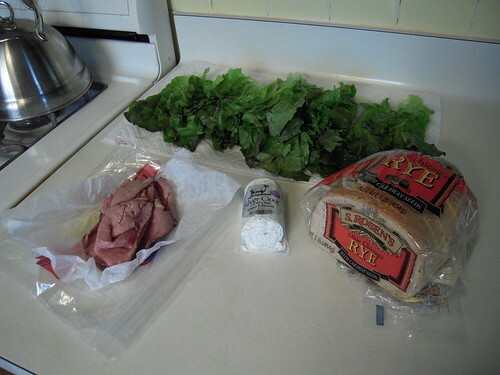 Step 2: Meat & lettuce. That’s it! I told you it was simple. Step 3: Assemble a meal and enjoy! Note: Lay’s “Lightly Salted” chips are pretty decent, even if I mainly bought them because the pretty blue bag called out to me. Also note: The jury’s still out on that Cherry 7Up Antioxidant. I refuse to be held accountable if you hate it. As a grad student, I don’t have a ton of money for eating out all the time. (And, honestly, I can’t even figure out how I managed that as an undergrad. How I miss my more-than-weekly Chipotle trips!) Most of the time, I come home to eat. Living close enough so that I can do that is really nice..definitely one of the advantages of living in such a small city. Eating lunch at home, I have to find things that are quick and easy to make, yet substantial enough to carry me through the rest of the day. 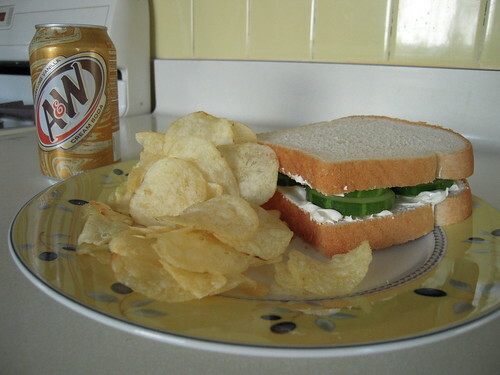 I’m a big fan of sandwiches. 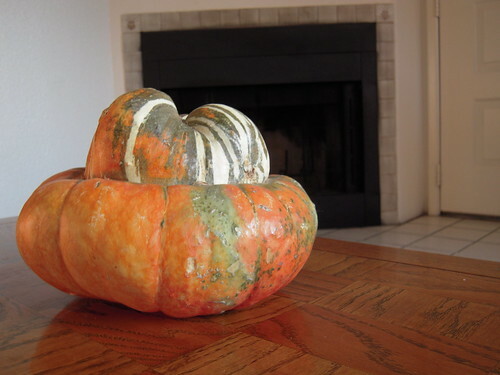 I was thinking it might be fun to introduce a new weekly feature, kind of like last year’s Squash of the Week, where I share some of my personal favorites! So here goes. I’ll keep it up as long as I can keep the sandwich creativity going. 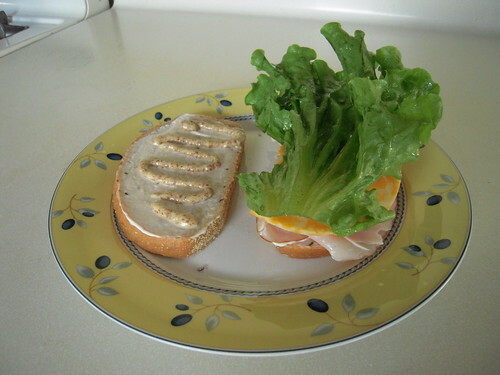 Turkey on rye! Step 1: Get your spread on. 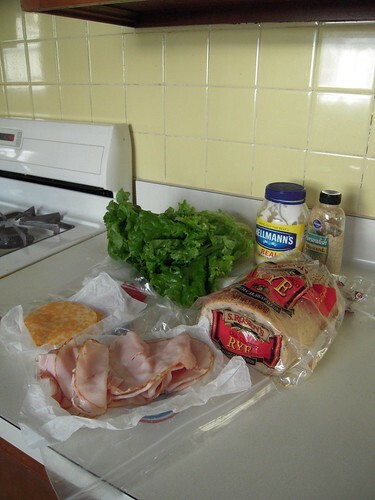 Step 2: Meat, cheese, lettuce. Order unnecessary. 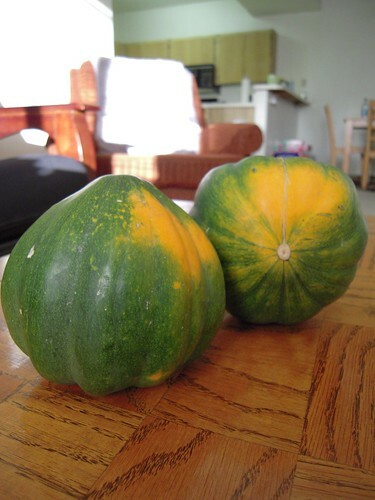 This week’s squash is the ACORN SQUASH, one of my personal favorites. 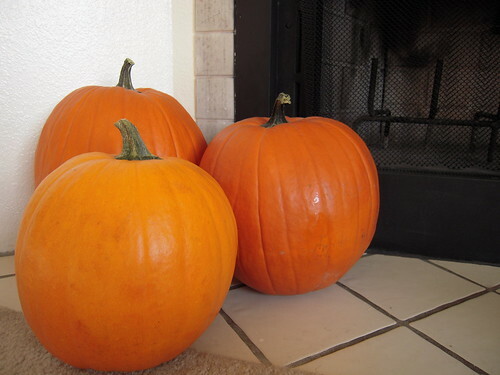 It’s fairly sweet, a bit like a pumpkin, and delicious baked with some butter! 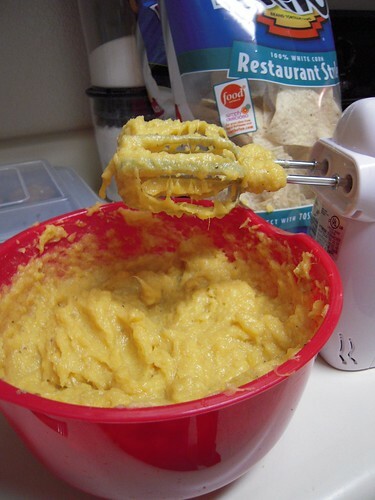 I thought I’d get a little crazy tonight and make some squash dip for my football guests. 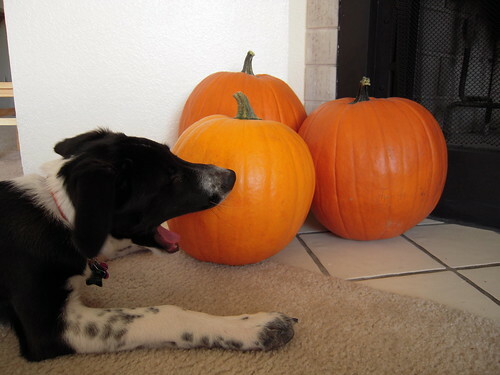 I made the mistake of adding a bit too much olive oil to the squash to cook it. Between adding melted butter, garlic powder, sour cream, and the turban squash from last week (it never became a soup), things got a little away from me. In the end, I still thought it was, really, a bit gross. Somehow, everyone else liked it? They liked it. That or my friends are unnecessarily nice..it’s one or the other. 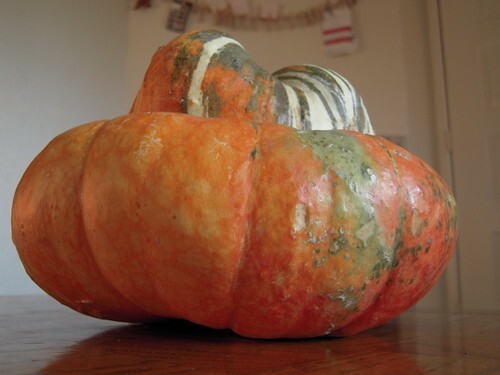 This week’s squash is the TURBAN SQUASH. 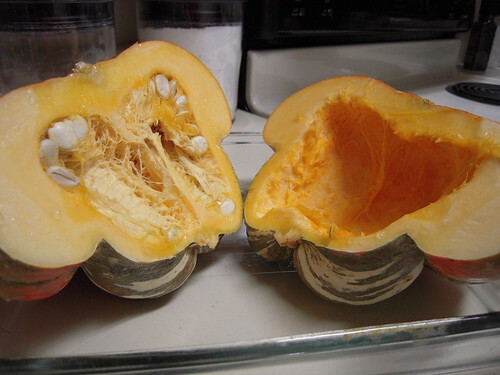 When I opened this one up, the smell and the fat seeds were reminiscent of my buttercup squash adventure. Figuring the seeds were mostly hull, I just tossed them. The squash is actually in the oven now..but I’m actually going to MAKE SOMETHING with this one! 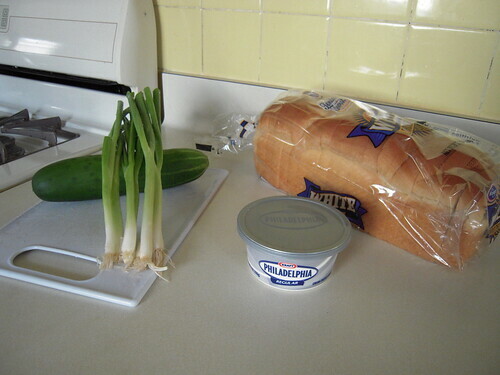 I’m planning on whipping up a soup tonight or tomorrow. :o) I’m really looking forward to it. I hope the weekend’s treating everyone well! 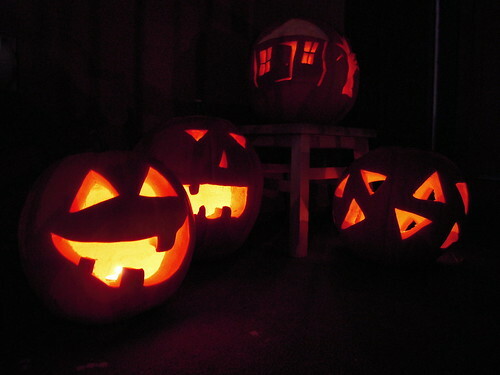 Who doesn’t love pumpkins at this time of year? We didn’t eat them, but I suppose we could’ve.. Instead of going with traditional salted pumpkin seeds, I got a little crazy and created a few new varieties that I’d like to share. Both are quite tasty! Preheat your oven to 300 degrees (F). Combine the seeds and the melted butter in a bowl, then add everything else. Stir it up really well. Put the coated seeds on a cookie sheet covered with aluminum foil, and spread them out as much as possible. Cook in the oven for 30 minutes, stir a bit, then cook for 15 more minutes. Preheat your oven to 300 degrees (F). Combine the seeds and the melted butter in a bowl, then add the seasoning. Stir it up really well. Put the coated seeds on a cookie sheet covered with aluminum foil, and spread them out as much as possible. Cook in the oven for 30 minutes, stir a bit, then cook for 10 more minutes.